(17 February 2017) – In the latest edition of its newsletter the Permaculture Association has posted a report on a course that explored the ‘fertile edges’ of permaculture action-research. For a total of five days (9-13 October 2016), ‘Casa Vale da Lama’, an educational farm and eco-resort near Lagos, Portugal, was venue to the (probably) first Permaculture Research Design Course of its kind. The main facilitators Rafter Sass-Ferguson and Hugo Oliveira with their colleagues from Lisbon University lead by Gil Penha-Lopes were taking a considerable risk. 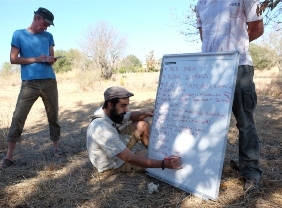 Could efforts creating and running a Permaculture Research Design Course be fruitful? Given that many years before protagonists Mollison and Holmgren had decided to shun academic institutions altogether. A gender balanced and age-diverse group of nearly 30 participants from five continents had gathered in the Algarve. After dedicating a minute of silence in memory of the recently deceased Father of Permaculture Bruce Charles Mollison, they committed all their creative energy into making their worlds of science serve the three permaculture ethics: Earth Care, People Care & Fair Shares.